A steel garage building is a quick way to erect a new steel garage saving 30 to 40% on erection time and it lets you enjoy great savings over the cost of conventional construction. Steel garages require no special tools and are available in a variety of models in sizes from 10 to 100 feet wide and as long as you want. 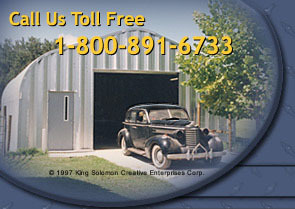 With the use of colored endwalls and arches you can customize a steel garage to acquire the look you desire. Virtually maintenance-free, steel garages from American Steel Span are made of AZ55 Galvalume® containing 55% aluminum, 43.5% zinc and 1.5% silicone with a direct warranty from the steel mill. An American Steel Span steel garage building is seven times more rust resistant than galvanized steel garages. Each Steel garage building is designed with wind and snow loads in mind using a minimum of 23 gauge to 22, 20, 18, 16 and 14 gauge steel. Steel garage kits are easy to assemble. With steel garages you simply bolt the arch sections together on the ground, raise the arches into place and install the endwalls and any additional steel garage accessories such as doors, windows, skylights or vents.